At the turn of the century, it may have been something confined to the figment of a science fiction writers imagination. The ability to quickly and comfortably fit ultra-thin permanent contact lenses to a patient’s eye, with the effect of providing perfect vision – and permanently. Today, however, permanent contact lenses (also known as implantable contact lenses) are a reality, much to the delight of patients suffering with severe long or short sightedness. 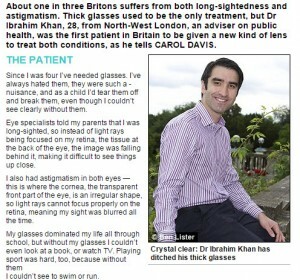 As many patients like Dr Brahim Khan have discovered, Advanced Vision Care is the ideal place to have the procedure done (as seen in the Daily Mail article – A contact lens INSIDE my eye has given me perfect vision). Who Needs Permanent Contact Lenses (and Why Not LASIK Instead)? For the majority who are searching for vision correction, LASIK laser eye surgery will often be the most suitable treatment choice. However, for patients who have extreme long or short sightedness or astigmatism LASIK treatment is unable to provide a solution. You would be forgiven for thinking that the implantable contact lenses procedure might be rather gruesome. In fact, it is quite the reverse – the entire procedure takes no longer than 30 minutes and is completely void of injections or stitching. The only real inconvenience is that both eyes are not able to be treated at once. Many would-be patients also commonly ask whether the artificial lens can be felt once the procedure has been done – the answer is no. You see and feel exactly the same as you would normally. Furthermore, it surprises many patients that they are able to leave the clinic on the same day, ready to enjoy a life of crystal clear HD vision. So, if your prescription seems hopeless, there’s no need to despair as your friends book LASIK and enjoy a life free of restrictions, while you watch through smudged glasses or fiddle with contacts. Permanent or implantable contact lenses are here and they can help. This is the only ICL approved by the FDA (USA) and approved by the US military for the last 10 years. Advanced Vision Care on Harley Street has been carrying out ICL procedures for over a decade, and were one of the first to offer this cutting edge treatment in the UK. Interested in Permanent Contact Lens treatment? If you would like to find out more about permanent contact lenses and ICL treatment at Advanced Vision Care and how it can transform your eyesight, then why not call AVC TODAY on 0800 652 4878 and request your free information pack or book your consultation to find out how we can help you.